This work represents a dialogue between an invisible inner reality and the outer world of concrete manifestation expressed in the materials of artmaking. Most of the work reflects the explorations of my own spiritual journey. I like to think of my paintings as expressing fundamental energies which are the basis for life in the universe. Certain works are part of healing experiences both for myself and others while the majority of the work exemplifies studies of scientific and spatial concepts. Some pieces of my current work have been referred to as energy healing paintings and meditation mandalas. I have tried to make visible the invisible and to make the unknown more understandable based upon my research in metaphysics, comparative religions, and science. 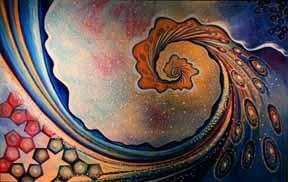 The transformation of matter through paint, canvas and forms symbolizes my psychological and spiritual transformation. Over the years I have made several trips to England, Scotland and Norway to study ancient megalithic sites; making sketches and drawings, photographing old stone circles, sacred wells and mounds. Later, I have translated my impressions into paintings which represent abstract meditations about the cycles of life, gates, portals, hills, valleys, circles, spirals and pyramids which seem to indicate power sources of energy that charge living beings with the Life-force. 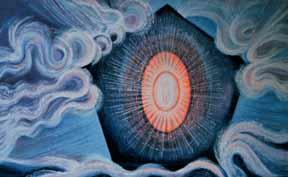 The two paintings, The First Portal and The Last Portal, exemplify my studies in metaphysics. The First Portal symbolizes the birth of the spiritual self in a kind of healing glory. The painting The Last Portal means a transcendence of the mortal death experience and the leaving of the "alchemical crucible" of the mortal body, moving on, and perhaps traveling through a celestial space to other worlds and other dimensions. This work touches upon the core of the basis of life itself and the meaning of creativity. All text and images © Barbara Bruch.